Hot cross buns - yummy, soft, sticky buns studded with raisins or currants, redolent with spices and marked with a cross on top are traditionally eaten on Good Friday. You can make them any time of the year- no one's going to chop off your head or put you in prison if you do. I like to use a mixture of currants and raisins and this time, I didn't have any mixed peel so I omitted it though it's included in the recipe. Along with the clove, cinnamon and nutmeg powders, I used lebkuchen powder. You can use a little allspice powder instead. Also, I do not use eggs in this recipe. 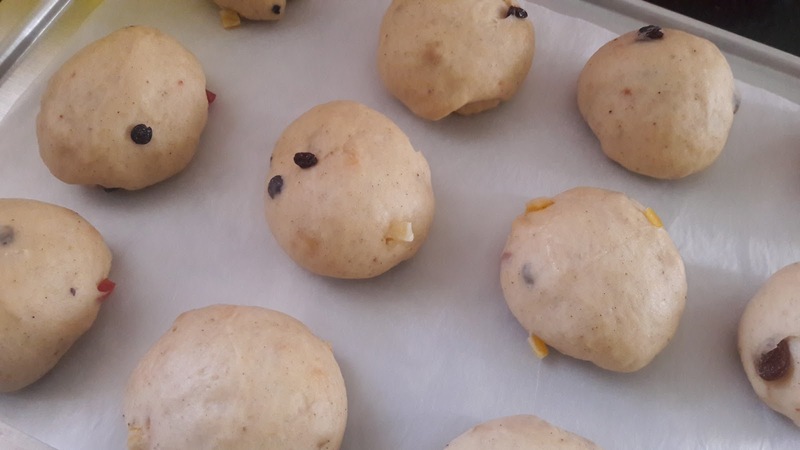 Make your bun dough either in your processor or bread maker or on a worktop, knead in the currants, raisins and mixed peel by hand so you don't pulverise the dried fruit. Since it's a sweet dough, it will take a little longer to proof. While the buns bake, make the glaze. Some years ago, we had new neighbours and their little girl was very fond of coming over especially when I was baking. That day, I had a pretty large order for hot cross buns and she wanted to watch me pipe the crosses. I hoisted her up onto my worktop and started piping. 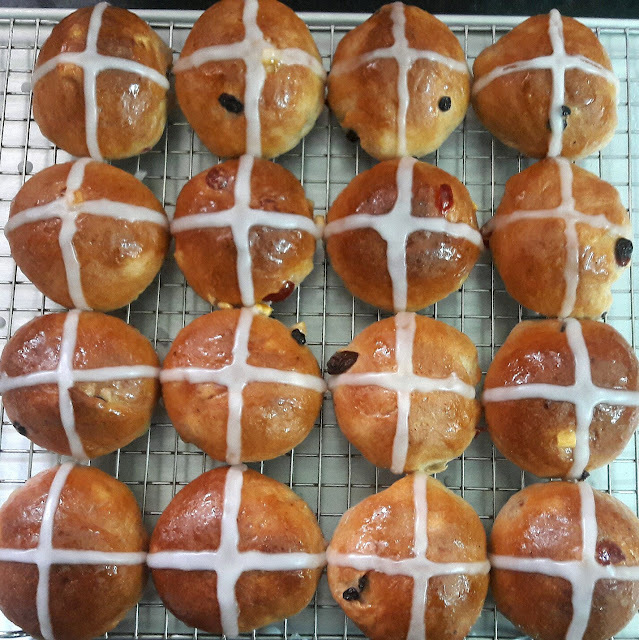 I finished the first rack and moved on to the second one and when I finished, was surprised to see some of the crosses on the first tray of buns were no longer visible. Wondering why they had disappeared. I piped the crosses again and then I saw it- a little finger reaching out and scraping off the icing. Caught the culprit red handed!! Boil together 2 tablespoons water and 2 tablespoons sugar. Sieve 1/2 cup icing sugar, mix with 1-2 teaspoons water. Sieve the flour along with the spice powders. Put the flour, yeast, gluten, sugar, milk powder, salt and butter into the processor. Switch on the motor to combine the ingredients, slowly add the water till the dough forms lumps. Run the machine for a minute more to mix the dough well, take the dough out and place it on a floured worktop and knead it briefly. When it is soft and springy, knead in the dried fruits and peel. The fruits will fall out, so just push them back into the dough. Place the dough into a large, well greased bowl, cover the top with clingfilm and place it in a warm cupboard to double in size. It may take an hour and a half. Punch it down and shape into 12 equal pieces, shape into buns and place on a baking tray with enough space between the buns. Proof for a second time, about 20 minutes. Preheat oven to 190°C, bake the buns for about 12-15 minutes or till golden brown. While the buns are baking, make the glaze by boiling the sugar and water. When they are done, take the buns out of the oven and brush them with the glaze, move them to a wire rack. Combine the icing sugar and water to a thick paste, fill a paper cone with the icing, cut the tip and pipe crosses on top.